My life has been a journey through valleys, peaks and even plains. valuable lessons nonetheless...happy ones and heartbreaking ones. Muddling my way through LIFE with the commitment to learn what I need to learn and to operate with compassion both for myself and for others. As one sagely figure once said, "You who is without sin-cast the first stone". So most of you know that I received my ministerial ordination after interview, essay and life commitment past and present. My ordination is in Spiritual Healing and I've done and am constantly in action to build up the foundation and house of my ordination. I am proud to say that yesterday I completed my training in Hospice care. This has been a wonderful opportunity and wonderful time of reflection and learning. My gifts to put into action in the Hospice care will be the training I've had in Reiki, Reflexology & Aromatherapy. 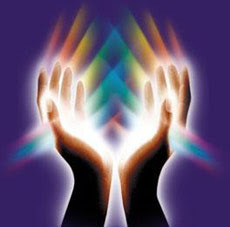 Reiki for me will continue to be a life long work and study in the spiritual energy field. I've completed (?) the initial foundation for Reiki training up till Reiki Master level both distant learning and in-person learning. I decided on this route so that I will have a wide range of people and philosophical/practical thoughts to learn from. In fact it was the Reiki Master Teacher I prayed to meet that introduced me to the Hospice Care program. It was my prayer/hope to meet a teacher that was committed to giving of herself to help others. And...we found each other. The power of prayer/hope and intent is very powerful. I put a question mark next to "completed" in regards to Reiki training as I believe that ones training is never fully complete, it is a daily or life long practice. Of working with spiritual energy that surrounds and flows through us all. I am also finishing my diploma in Reflexology. This therapy is not regulated in my state however I wanted to make sure I have a full and solid foundation in the art so that I am able to really offer something meaningful to clients. As part of the program I've been deeply entrenched in Anatomy and Physiology. As a matter of fact I am studying hard for an up coming final. Physiology is FASCINATING. The human body is this intricate and advanced mechanism. It can only make me saw WOW! My favorite organ is the liver!!!! If more of us understood how the body actually works and how delicate it is to maintain homeostasis I believe we would be kinder and more concerned about what we put or don't put into it. This is just a minute glimpse into the commitment I have made to my spiritual ministerial ordination, self and life.